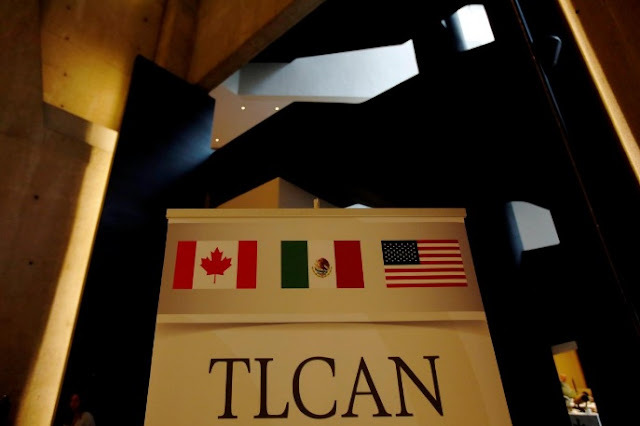 FILE PHOTO - A NAFTA banner is pictured where the second round of NAFTA talks involving the United States, Mexico and Canada is taking place in Mexico City, Mexico September 1, 2017. OTTAWA - Talks to update the North American Free Trade Agreement looked set to intensify on Saturday as U.S. negotiators prepared for the first time to unveil their demands on some of the Trump administration’s most challenging issues. Teams from the United States, Mexico and Canada kicked off the third of seven planned rounds of discussions in Ottawa amid warnings from trade experts that time was quickly running out to seal a deal by the end of the year as planned. “It’s up to the Americans to indicate their precise ideas because they are the ones who want to renegotiate NAFTA,” Andrew Leslie, a legislator from Canada’s ruling Liberal Party and a member of the influential cabinet committee on U.S. relations, told reporters on Friday. U.S. chief negotiator John Melle said ahead of the talks that his team would introduce the difficult provisions in Ottawa talks that are due to last for five days. U.S. President Donald Trump is demanding major changes to the 1994 NAFTA deal, which he says is weighted against his country. One tricky issue is labor. U.S. and Canadian unions say Mexico’s low wages give it a manufacturing advantage. The United States is also expected to present text proposals on intellectual property and investment, several sources with knowledge of discussions said. Other areas of disagreement include dispute settlement mechanisms and how much content from NAFTA nations autos should have. Canadian and Mexican officials, as well as U.S. businesses, have already rejected a proposal by Washington to include a five-year sunset provision in the updated agreement, saying it added uncertainty to business investment planning. Canadian government figures are cautious when asked whether the end-December timetable is realistic. “We want, not a quick deal, but we want a good deal and a fair deal,” Innovation Minister Navdeep Bains told the Canadian Broadcasting Corp on Friday. The Trump administration is particularly focused on lowering the U.S. trade deficit and updating rules of origin, which dictate how much of a product’s components must originate from within North America to qualify for tax free status under NAFTA. Trump wants more U.S. content in autos, citing trade deficits of $64 billion with Mexico and $11 billion with Canada. He has threatened to walk away from the agreement unless he gets the changes he wants. It was unclear whether the U.S. delegation would be presenting specific proposals on rules of origin in Ottawa.